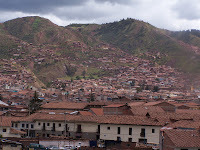 When we visited Peru in April, we remarked on how vibrant Cuzco felt. Though the enchanted smells, the colorful clothing, and the adobe architecture contributed to this vibrancy, we determined it came primarily from the diversity. Babies, old people, llamas, dogs, tourists, school children, wealthy and poor, bicycles, cars, pedestrians, houses, churches and cafes, everyone and everything were mixed together in a lively hodge podge of activity and texture that created real Place. It was such a startling contrast to the many No Places in the United States where there is tidy, compartmentalization between everything. Business districts separated from houses, old from young, schools from the community, rich from poor . . . Some of the Places that I love most in the United States -- DelRay, Alexandria, VA, Old Town Winchester VA, and numerous places like them -- mix things up. People walk past shops and businesses with baby carriages. Retirees eat lunch at cafes and chat with children and people in suits. Couples live above shops and walk to the library and the post office. There's a feeling of vitality in these places that has been eradicated from the suburbs where there is no diversity in age, race, use, or social economic status. Ironic how sprawl diminishes the important lines between towns and countryside, yet separates with knife-like precision the people who live there.